A white-fleshed peach with an excellent flavour, well-suited to temperate climates. This is a free-stone peach - the stone falls cleanly from the flesh. Peregrine is self-fertile and does not need a pollination partner, although fruiting may be improved if there is a compatible tree of a different variety nearby. 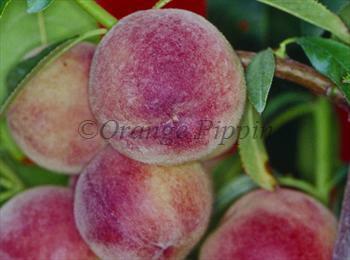 Peregrine is one of the most suitable peaches for growing in an English climate. It crops well and is hardy. However, it best grown in a sheltered location in good sun, or ideally trained as a fan against a south-facing wall. Developed by Rivers of Sawbridgeworth, UK, in 1906.